Certainly, the language used made it difficult at times to listen and decipher what was being said. Please stop the faux-Brit accent. It makes it much harder to understand what you're saying when you're focusing on your pronunciation rather than the meaning of the text. Yeah, I know this particular author happened to be English, but Plutarch wasn't. Nor was Mommsen. Thanks! you got what you asked for. this is a very informative book. It's not necessarily big on giving you exact dates of when every little bit of History happened. However it does convey the feelings and the ideals behind the Holy Roman Empire at each point in time. After every Epoch it show what the lasting effects were. but along with this very informative positive. It also comes with a strong negative. You have to remember that this is a book that was published in 1864. the sentences are very complex and long and drawn-out. the translations into Latin words are not given. and the history they convey may sound a little confusing because their contemporary is not our contemporary. But, if you are looking for information on the Holy Roman Empire and find it scares and hard to find. This is the book for you. 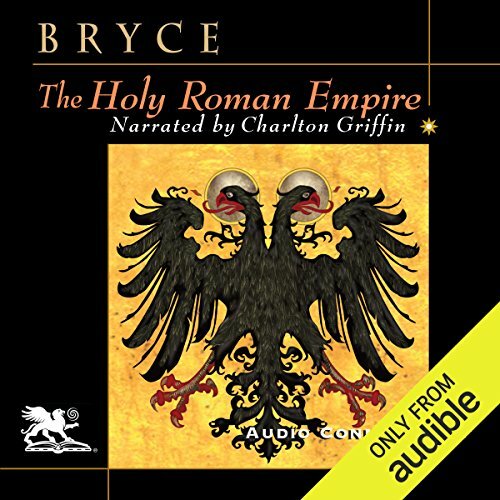 Excellent overall view of the Holy Roman Empire, covering not only the historical events but also the philosophical, religious issues, political forces and people's beliefs of the different times in which the institution of the Holy Roman Empire either prevailed or coexisted with the Papacy, the Eastern Roman Empire and other kingdoms. Beautiful performance, with fitting old fashioned British accent and great care in pronouncing names in the correct way for listeners conversant with vernacular languages, including latin. Some repetition of ideas here and there in the story to reinforce them, but at times somewhat otious. Pretentious 19th century British accent. The style is excessive elaborate. You easily lose track of the story and wonder what on earth is this writer, and narrator, trying to convey. NOT an easy but addicting listen! This is an advanced study that focusses on causes and consequences. Know your history first. The names and dates go by so fast if mentioned at all that I found myself constantly trying to catch up with what was being told. That being said, once I got into the book, I couldn`t stop listening to it and I did learn more than I expected by the end. NOW, I going to go back and listen to some more history of the period and may, just may listen to this book again. Griffin does an outstanding narration. Although I have a great interest in the subject matter and believe that there is much good content here, I found the pedantic writing style and the matching reading more than a little off putting. As an audiobook, it just doesn't work. 4 sur 12 personne(s) ont trouvé cet avis utile.